Valentine's Day is fast approaching. It's one of my favorite holidays. Call me a hopeless romantic, but I love the chocolates and flowers and kisses all around, along with the pinks and reds. Yea, it's a bit corny, but I'm just a corny type of person. 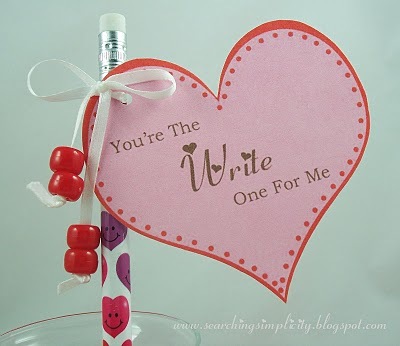 I made these "You're The WRITE One For Me" tags years ago for my daughter's class Valentine exchange. Yes, I cut each and every heart out (with her help of course). I found some cute pencils at the Dollar Store and attached the tags with ribbon and beads I had on hand, just for decoration. TIME SAVER TIP: An easier way to attach the heart tag to the pencil would be to punch a hole on either side of the tag and slip the pencil through. The tag would then be attached to the middle of the pencil. 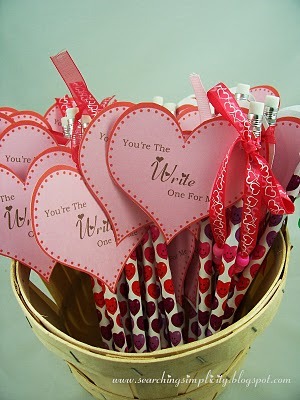 This might work better if you plan on using these as class Valentine's that need to fit in a shoebox "mailbox". Your child can write their name on the back of the tags.